At this point in the season, most all of the Poke berries have been devoured by birds, fallen from their stems or have been harvested. 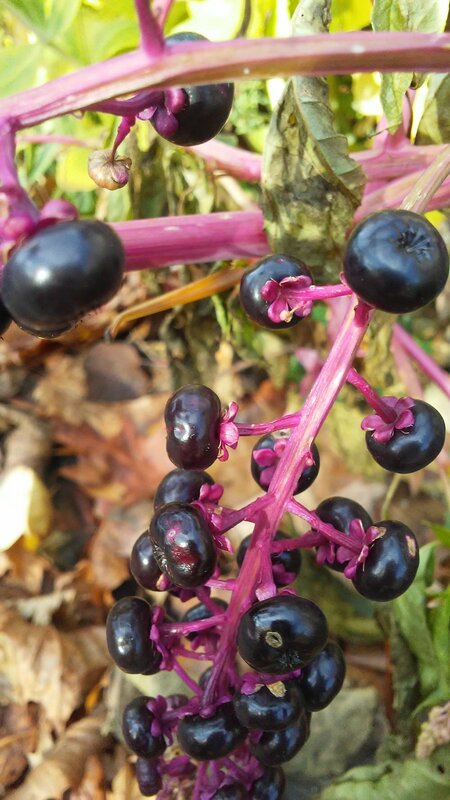 That aside, I wanted to share the photo to the right that I took back in late November of the beautiful and hauntinly dark purple berries of the often over-looked and sometimes feared "weed" known as Pokeweed (Phytolacca americana). Poke berries can be harvested in the late Summer/Early Autumn and made into delicious and temptingly addictive jams or jellies to be spread on toast, fruit or simply eaten straight from the jar by the teaspoon. When one decides to work with Poke, knowledge of this remedy along with large amounts of caution must be taken when administering dosage. The entire Pokeweed plant can be toxic, the berries being the least toxic and the roots the highest. Ironically, Poke is a very effective and strong medicine that should be administered with the utmost attention and care. From my experience, 1-2 tsp. of the jelly or jam twice a day is a sufficient dose and can be increased depending on a persons need. Historically, the juice of Poke berries have been and can be used for ritual purposes as a magical ink. It is said that the Declaration of Independence was written with fermented Poke Berry juice. In my opinion, this is an intriguing morsel of information when one considers the intentions behind the document itself. Perhaps this may help bring to light the "spells" and words used by the 'Powers That Be' to sell people an external, warm & fuzzy sensation of "Freedom". The medicinal use of poke, along with that of many other herbs, was handed down to us by the Indigenous Peoples of the Americas, who valued it as an laxative and a heart stimulant. They also used Pokeweed for food, medicine, dye for fibers and to paint their horses. Beneath the soil, the roots of Poke grow quite large, strong and deep. 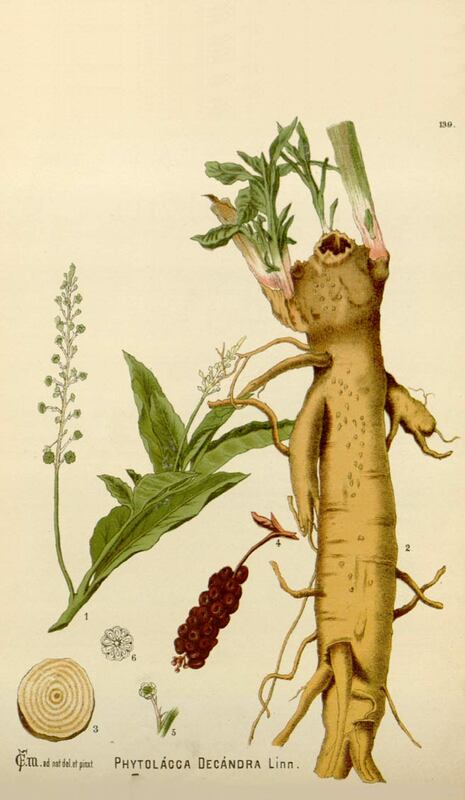 When harvested in the Autumn or Winter after the first frost, the fresh root can be made into a tincture and is a highly valuable immune system stimulater. It can help clear infection, remedy and relieve symptoms associated with arthritis/rheumatism and even help to cure and prevent certain types of Cancer! To help prevent potential infection, I have had personal success with a ONE DROP of Poke Root tincture daily for a few days after a tooth extraction earlier this year along with the consumption of 1 tsp. of Poke berry jelly, twice daily, one week before the extraction. Pokeweed is said to be rule by the planet Mars. To me this makes sense due to Poke's strong affinity for the immune and lymphatic systems, as it stimulates and "gets things moving" with it's fiery energy. Herbalist Susun Weed says that Poke Root has the ability to "Poke" your immune system and kick it into high gear. Like the jelly, dosage of the root can be SLOWLY increased over a period of a few days. Prolonged and preventative use is not advised as Poke Root should be reserved for emergencies. Because high doses of Poke can be poisonous, begin with ONE DROP and increase, ONE DROP at a time, only if needed. Even with a small dose of two drops in one day, I experienced the sensation of an altered state and decided that ONE DROP was what my body required.